The pair moves lower to 2-day lows near 1.3250. WTI gains sustaining the down move in spot. Fed’s Powell, API report next on the calendar. The greenback is retreating from recent tops vs. the risk-complex and is motivating USD/CAD to ease further ground to the mid-1.3200s, or daily lows. Spot has receded to new 2-day lows in the 1.3250 region on the back of the renewed sentiment surrounding the riskier assets along with the rebound in crude oil prices. In fact, CAD is appreciating further in tandem with today’s recovery in prices of the barrel of West Texas Intermediate to levels above the $53.00 mark, extending the move to 3-day peaks. Further positive news in the risk-associated space comes from hopes of a potential agreement between China and the US in light of this week’s trade talks. According to market chatter, an extension of the current 90-day truce deadline could be announced later in the week. In the data space, Chief Powell is due to speak later in the day, although mentions to monetary policy appear unlikely. Earlier, the NFIB index came in below expectations at 101.2 for the month of January. Later in the NA session, the API will report on US crude oil stockpiles. 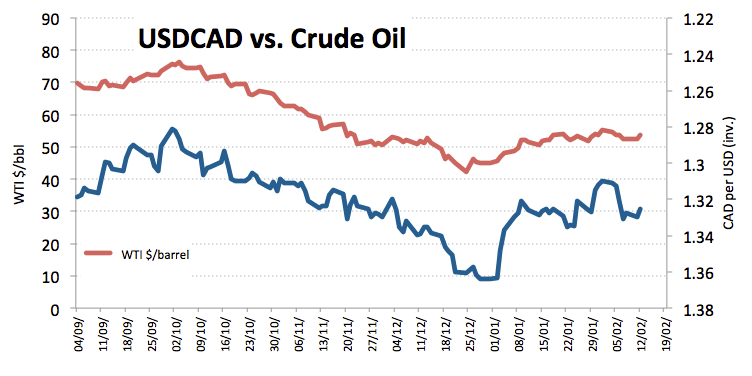 CAD keeps looking to the broad risk-appetite trends and crude oil dynamics as the main drivers of the price action in the near term, as speculations of further tightening by the Bank of Canada appear somewhat mitigated. Furthermore, the Canadian Dollar should remain vigilant on headlines from the US-China trade talks starting this week in Beijing. As of writing the pair is retreating 0.37% at 1.3250 and a breach of 1.3242 (21-day SMA) would aim for 1.3223 (50% Fibo of the October-December up move) and then 1.3195 (10-day SMA). On the other hand, the next up barrier emerges at 1.3329 (high Feb.8) followed by 1.3334 (55-day SMA) and finally 1.3375 (high Jan.24).